To the Park We Go! | One Picture, A Million Words. To the Park We Go! I am all for cooking dinner from scratch every night but it is a different story when it comes to lunch. What I do is to set aside some food from dinner and heat it up the next day in the microwave. This “cook once, eat twice” method of feeding my kids is quick (45 seconds!) and easy (no planning required!) and I would be crazy not to follow it. Of course, there is a caveat: when last night’s dinner did not go down well. But today is not one of those days. I packed a picnic lunch for the kids to eat at the park as Lana had a play date with a friend. 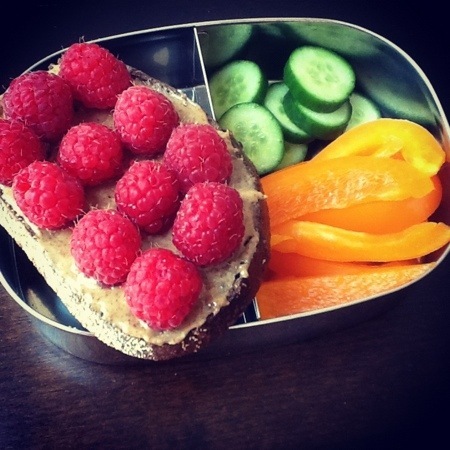 Almond butter and raspberries on toast and some crunchy veggies to round out the meal. Look at the pretty colours. It is like finding a rainbow in your lunch box.